Edith E. Tisdel, 99, of Cedar Springs, passed away Wednesday, March 16, 2016 at Porter Hills. 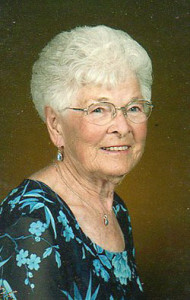 Mrs. Tisdel was born May 7, 1916 in Cedar Springs, Michigan, the daughter of Lavern and Muriel (Lincoln) Hatch. She had been a member of the East Nelson United Methodist Church, the Spencer Mills Ladies Aid and a lifetime member of the Eastern Stars. She enjoyed making cakes for all family events, homemade bread and scubbies and going to the lake in the summer. Surviving are her daughters, Shirley (Jerry) Cadaret, Sharon (Don) Hopwood; six grandchildren; 12 great-grandchildren; seven great-great-grandchildren; one niece and one nephew. She was preceded in death by her husband, C. Wayne Tisdel in 1999; brother, Matthew Hatch and a great grandson. The family greeted friends Friday, March 18 from 6-8 pm at the Bliss-Witters & Pike Funeral Home, Cedar Springs where the service was held Saturday at 2:00 pm. Pastors Herb VanderBilt and Chuck Smith officiating. Interment East Nelson Cemetery. Memorial contributions may be made to East Nelson United Methodist Church.